The BBC reports on a petition to ban homoeopathy for pets, which is already singed by a 1000 British vets. The justification for this is that homoeopathy does not work. The vet who started the petition said: "It's been shown that homeopathy doesn't work, so it probably shouldn't be offered any more even if it is offered with good intentions." Classical homoeopathy naturally does not work. It works with strong dilutions, some are actually so strongly diluted that you can show that most bottles do not contain anything. Furthermore, homoeopathy is taken as pills or drops. This means that you can make a double blind randomized trail. You randomly give half the people the "medicine" and half a fake medicine (placebo). The patient and doctor both do not know who got what (double blind). At the end you analyse whether there was a difference between the medicine and the placebo. If you pass this trial, your medicine works, no matter how it was made, whether is was conventional or homoeopathic. Also for many traditional medicines it is not known (well) how they work, but the double-blind randomized trail shows that it does. Classical homoeopathic medicine has failed this foundational test. However, that homoeopathy does not work is not sufficient reason to ban it. It also does no harm and in doubt we should always chose the side of freedom. Government action is there to fix important wrongs, not for stuff that just makes us uncomfortable. In The Netherlands doctors often tell their patients to simply go home, sleep and if the symptoms do not go away come back in a week. I like that, I am Dutch. Isn't it a relief when the doctor tells you it is not something serious and you should just go to bed? Sounds fine to me. Foreigners mostly hate it. If they do not get a pill they do not feel taken seriously and they can even get quite aggressive. I would not be surprised if their anger leads to an anti-placebo effect. Why not give them something homoeopathic? That is better than unnecessary medicine, which may do harm, and lot better than over-prescribing on antibiotics. The vet in the BBC article gives the impression he really believes in homoeopathy. That could be problematic. I would avoid such doctors because they clearly do not understand how to evaluate evidence. But a doctor who pragmatically prescribes it in case someone should just go to bed would be fine. It could also be that the medicines this vet prescribes are not classical homoeopathy, but herbal medicine, which is often marketed as homoeopathic. Those could naturally work, many conventional medicines come from substances that were used in traditional cures in healing traditions from all over the world. The active ingredient of aspirin famously comes from willow bark. That is why I do not like intolerance directed against traditional medicine; we should study it, see if it works, try to understand why it works, how to reduce side effects and how to improve their effectiveness. In many cases we do not have clear evidence against it, like we have for classical homoeopathy, and even if the "explanation" of how the cures work makes no sense we should keep an open mind that the actual treatment does bring benefits. If a "homoeopathic" herbal medicine would pass the double blind trial, you could sell it as a normal medicine if it works better than existing medicines. Thus for me it is a bad sign when a pill is marketed as homoeopathic. Although, I do not know whether it is true, but I once heard an ironic story about a pill that went through all the tests and was approved as conventional medicine, but then the marketing department decided it was better to sell it as a herbal cure. There is a parallel to the climate debate. Science can tell you some of the consequences of continued fossil fuel use. Science can tell you classical homoeopathy does not work. Science cannot tell society how to respond to climate change. Science cannot tell whether we should ban homoeopathy. As a citizen I feel we should transition to renewable energy. As a citizen I feel we can be tolerant towards homoeopathy. [UPDATE, Oct 2016. Apparently it can be legal in the USA to take your kid to a faith healer rather than the doctor in case of serious illnesses. Even when the kid dies as a result. That is where my understanding ends. If a kid (or for this post a pet) has a serious illness, you should go to a real doctor or face the consequences of the law. Steven Novella, MD, academic clinical neurologist at Yale University School of Medicine and president and co-founder of the New England Skeptical Society want to ban homoeopathy for pets: Should We Ban Homeopathy for Animals? * Top photo: Cats by Abdullah AlBargan, used with a Creative Commons Attribution-NoDerivs 2.0 Generic (CC BY-ND 2.0) license. 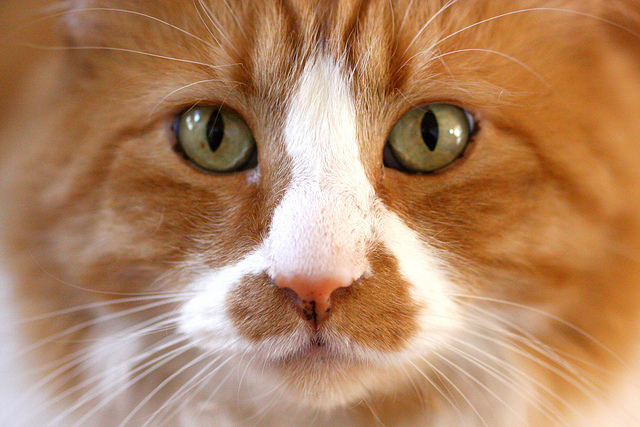 * Middle photo: Cat, MacDuff the cat by Kevin Dooley, used with a Creative Commons Attribution 2.0 Generic (CC BY 2.0) license. 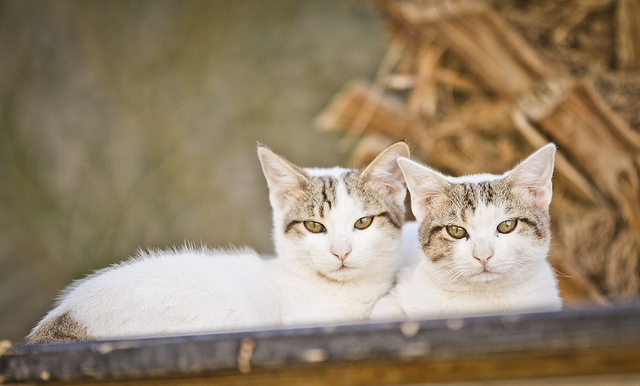 * This post was a wonderful excuse to finally write a popular post with cute cat photos. Is it time to freak out about the climate sensitivity estimates from energy budget models? Estimates of climate sensitivity using simple energy budget models tended to produce lower values than many other methods. Consequently they were loved by the mitigation sceptical movement, who seemed to regard these as the most robust of all methods. Part of their argument is the claim that these are “empirical” estimates, conveniently forgetting the simple statistical model the method uses, that they still require information from physical global climate models for the forcings, and that global climate models output also fit the “empirical” temperature change (and many other observed changes). Before the last IPCC report the estimate for equilibrium climate sensitivity was between 2°C and 4.5°C with a best estimate of 3°C. I do not know of any explicit statement, but I have the feeling that the new studies with low estimates from energy budget models were the reason why the last IPCC report reduced the lower bound to 1.5°C. Since the reasons for the discrepancies were not understood the last IPCC report no longer gave a best estimate for equilibrium climate sensitivity. The equilibrium climate sensitivity is defined as the equilibrium change in global mean near-surface air temperature after doubling the atmospheric concentration of carbon dioxide. A Nature News and Views by Kyle Armour (2016) showed this week that three assumptions made in the simple energy budget models lead to strong biases. 1. This week Mark Richardson and colleagues (2016) showed that the temperature change is underestimated because we have few measurements in regions where the change is large, especially the Arctic. This masking problem creates a bias of 15%. 2. Climate change is mainly due to increases in carbon dioxide concentrations, but also warming due to increases in methane concentrations, cooling due to increases in aerosols (small airborne particles) and changing due to land use changes. Half a year ago Kate Marvel and colleagues showed that these forcings do not have the same global effect as carbon dioxide and that, as a consequence, the energy balance models are biased low. Marvel and colleagues estimate that this makes the estimates of energy balance models 30% too low. 3. Kyle Armour and colleagues (2013) previous work showed that in the early warming phase climate sensitivity appears smaller than the true value you would get if you would wait till the system has returned to equilibrium. This leads to an underestimate of 25%. Taking all three biases into account the best estimate from the energy balance models from around 2°C estimate becomes 4.6°C**; see Figure 1b of Armour (2016) reproduced below. Climate sensitivity estimated from observations1 (black), and its revision following Richardson et al. (blue) then following Marvel et al. (green), and in red the revision for the time dependence (Armour). The grey histogram shows climate model values. The equilibrium climate sensitivity from global climate models is about 3.5°C***, which is close to the best estimate from all lines of evidence of about 3°C. The "empirical" estimate of 4.6°C is now thus clearly larger than the ones of the global climate models. Is that a reason to freak out? Have we severely underestimated the severity of the problem? Probably not, there are many different lines of evidence that support an equilibrium climate sensitivity around 3, with a likely range from around 2 to about 4.5. That the simple energy balance models might now suggest a best estimate of around 4.6°C does not really influence this overall assessment. It is just one line of evidence. That the energy balance climate sensitivity is minimally above the upper bound does not change this. These energy balance models have not been studied much and the biases are so large that the correction need to very accurate, while they are currently mostly based on single studies. It is quite likely that this value will still change the coming years. If this value still holds after a dozen more studies you may want to consider freaking out a little. How uncertain this bias corrected climate sensitivity is is illustrated by its wide distribution in the above graph with a 95% uncertainty range of 2.5-12.8°C. There are many other lines of evidence for an equilibrium climate sensitivity around 3, from basic physics, to global climate models, various climatic changes in the deep past and the climate response to volcanoes. Before accepting values far away from 3 we would need to understand the physics of the feedbacks that produce such deviations. Figure 1 Ranges and best estimates of ECS based on different lines of evidence. Bars show 5-95% uncertainty ranges with the best estimates marked by dots. Dashed lines give alternative estimates within one study. The grey shaded range marks the likely 1.5°C to 4.5°C range as reported in AR5, and the grey solid line the extremely unlikely less than 1°C, the grey dashed line the very unlikely greater than 6°C. Figure taken from figure 1 of Box 12.2 in the IPCC 5th assessment report (AR5). Unlabeled ranges refer to studies cited in AR4. The figure in the review article by Knutti and Hegerl (2008) presented by Skeptical Science is also a very insightful overview. The likely range of possible climate sensitivity values has been between 1.5°C and 4.5°C since the 1979. That does not sound like much progress. However, we now have many more lines of evidence and those lines have been much better vetted. Thus we can be more sure nowadays that this range is about right. A large part of the uncertainty comes from cloud and vegetation feedbacks. Having worked on clouds myself, I know that these are very difficult problems. Thus I am not hopeful that the uncertainty range will strongly decrease the coming decade or maybe even decades. We will have to make decisions in the face of this uncertainty. Like any decision in a complex world. * The temperature trend of the air temperature over the ocean is 9% higher than the trend of the sea surface temperature in the CMIP5 models. For most models the top layer is 10 m deep. For those models with a higher vertical resolution the trend is only 8% higher. The difference is small and not statistically significant, but the effective resolution of numerical models is normally larger than the nominal resolution, thus I would not be surprised if studies with dedicated high resolution models may lead to estimates that are a few percent points lower. ** If we simply combine all these biases: 1.24 (Richardson) * 1.30 (Marvel) * 1.25 (Armour) we get that the simple energy balance models are biased by as much as a factor 2. Taking this into account could suggest increasing the best estimate from the energy balance models from around 2oC to around 4oC. Because of the uncertainty around the estimates and the thick tails, the estimate becomes 4.6°C. See Figure 1b of Armour (2016). 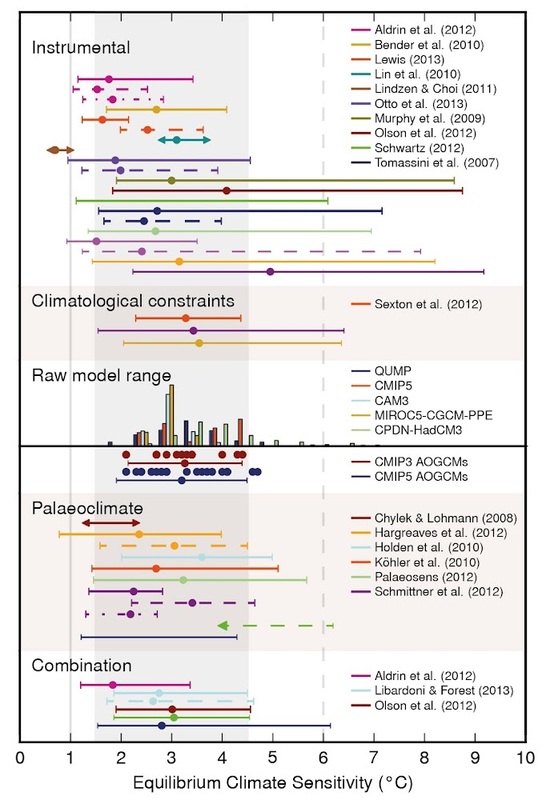 *** The ensemble of global climate models of the CMIP5 project have an average climate sensitivity of 3.5°C with a 95% uncertainty range of 2.0-5.6°C (Geoffroy, et al. 2013). **** Many thanks to Kyle Armour and And Then There’s Physics for many helpful hints and comments. Any errors are naturally mine. Nature Geoscience: Impact of decadal cloud variations on the Earth’s energy budget. A physical explanation of why climate sensitivities estimated from recently observed trends are probably biased low. An oldie from Science in 2004: Three Degrees of Consensus explains the various ways to estimate climate sensitivity and why it may have been more luck than wisdom that the first estimate of the range of the climate sensitivity still holds. Skeptical Science: How sensitive is our climate? Tough, but interesting for scientists: Andrew Dessler talk at Ringberg15 on why the equilibrium climate sensitivity exceeds 2°C. Armour, Kyle C., 2016: Projection and prediction: Climate sensitivity on the rise. Nature Climate Change, News and Views, doi: 10.1038/nclimate3079. Geoffroy, O., D. Saint-Martin, G. Bellon, A. Voldoire, D.J.L. Olivié and S. Tytéca, 2013: Transient Climate Response in a Two-Layer Energy-Balance Model. Part II: Representation of the Efficacy of Deep-Ocean Heat Uptake and Validation for CMIP5 AOGCMs. Journal of Climate, 26, pp. 1859- 1876, doi: 10.1175/JCLI-D-12-00196.1. Marvel, K., G.A. Schmidt, R.L. Miller and L.S. Nazarenko, 2015: Implications for climate sensitivity from the response to individual forcings, Nature Climate Change, 6, pp. 386-389. 10.1038/nclimate2888. Richardson, Mark, Kevin Cowtan, Ed Hawkins and Martin B. Stolpe, 2016: Reconciled climate response estimates from climate models and the energy budget of Earth. Nature Climate Change, doi: 10.1038/nclimate3066. If you cannot read this article at Nature, you can go there via The Guardian, which has a special link that allows everyone to read (not download) the article. See also the News and Views on this article by Kyle Armour. Otto, A., F.E.L. Otto, O. Boucher, J. Church, G. Hegerl, P.M. Forster, N.P. Gillett, J. Gregory, G.C. Johnson, R. Knutti, N. Lewis, U. Lohmann, J. Marotzke, G. Myhre, D. Shindell, B. Stevens, and M.R. Allen, 2013: Energy budget constraints on climate response", Nature Geoscience, 6, pp. 415-416. 10.1038/ngeo1836.